The write up for this project is split up into 4 parts – part 1: hacking the controller, part 2: decoding the protocol, part 3: the protocol definition, and part 4: hacks using the protocol. That way you can just jump to whatever interests you, or follow the whole thing first start to finish. There’s also a bonus post on achieving a similar goal by emulating the controller joysticks using an Arduino Uno. In Part 1 we were able to reverse engineer how the controller’s MCU and the Transceiver communicate, and successfully sniff and decode the SPI commands being sent between the two. Now we need to reverse engineer the protocol and configuration required to communicate with the Hubsan X4. 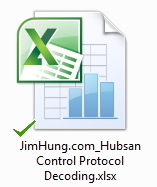 Using some basic tools like Microsoft Excel, key information from the data sheet, and a methodical testing approach, we can completely identify the Hubsan protocol and all the configuration parameters we need to set up the Transceiver properly. 1. Ensure all trim values are zeroed out. 2. Start Logic Analyzer (500MS @ 24MHz). Additionally, the Hubsan has an “Expert” flying mode that appears to make it more agile and able to do acrobatic tricks like flips – since this mode appears to affect all the normal flight controls, I also performed a second test of all of the above, but added the step of putting the quad into Expert mode between step 4 and 5. A final test was done to specifically test things like turning the LEDs on the X4 on and off, and whether expert mode is communicated or not. From here we can use a bunch of Excel/spreadsheet tricks to pick apart the data. Spreadsheet software might not immediately spring to mind when you think about reverse-engineering, but it often has a ton of very powerful tools like formulas and macros that make our job a lot easier. To make it easier to explain, I’ll talk about the rationale for the decoding and then how to use Excel formulas to scale the analysis section by section. Section 10 (starting page 30) of the AMIC A7105 Datasheet is the key to pulling out all the interesting details in our capture. The transceiver has 2 main types of command: control register commands, and strobe commands. Bit 0 – “CMD” – this bit tells the A7105 whether it’s a Control Register command (a “0”), or a Strobe command (a “1”). Bit 1 – “R/W” – Read the register, or write to it. Bits 2-7 – “Address” – the address of the register to read or write, between x00 and x32 (0-50). So this command would tell the A7105 to write the next set of bytes to the ID DATA register. The register and strobe commands are the building blocks for interacting with the transceiver, so it’s worth talking about how they come together to allow us to send and receive whole data packets. There are a number of transmission modes supported by the A7105, but I’ll just talk about the simplest one (that the Hubsan X4 happens to use) – “easy FIFO”. The A7105 has a First-In, First-Out (FIFO) buffer that is used to store data either TO be sent, or just RECEIVED. Once the transceiver is set up, to send a packet of data you have to first write the bytes to be sent to register 05h – the FIFO buffer. We do this by first sending a Control Register Address Byte of 0x05 followed by 16 data bytes. Once the data is in the buffer, sending a Transmit (TX) Strobe will make the Transceiver broadcast the contents of the FIFO buffers. Similarly, to receive data you send a RX strobe then read from register 05h. We can use this pattern of activity surrounding the FIFO (05h) register to find the packets that are being sent and received within our data captures. SPI Sniffing – Register Decode: a step-by-step breakdown of the SPI commands – the first step in decoding the protocol. Checksum Decoding: the steps taken to decode the frame checksum algorithm. Control Decode – Raw SPI: Default controls test regime. 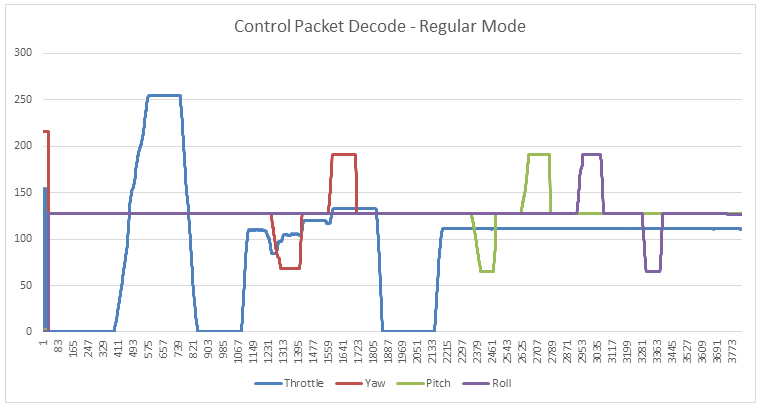 Control Decode – Packets: Default controls test regime – data packets. Expert – Raw SPI: Expert controls test regime. 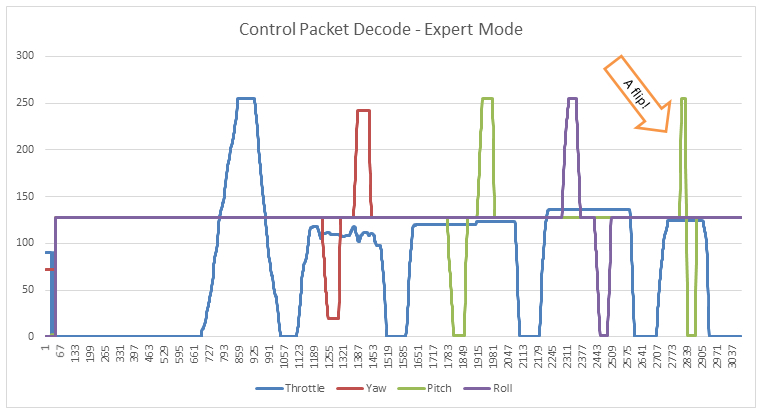 Expert – Packets: Expert controls test regime – data packets. 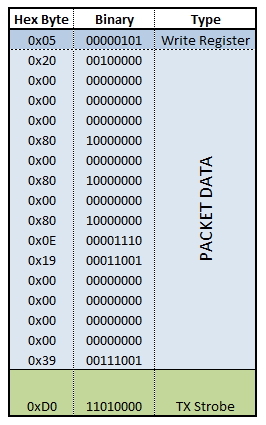 Addtl Controls – Packets: Miscellaneous control decoding – packets. Rather than explain the ins and outs of every formula, I’m just going to put them here and you can use the spreadsheet above to see how they work in practice. These formulas are used on the data exported straight out of Logic. Convert the byte to padded 8 bits, ignoring the “0x”. Identify if the byte is a Control Register, RegisterDATA, or Strobe message. If the byte is a Control Register message, identify if the operation is Read or Write, or DATA/Strobe. If the byte is a Control Register Address byte, extract the hex Address. If the message is a Read/Write to the FIFO buffer register (05h), build a text string out of the next 16 bytes, plus time stamp and read/write. These formulas are used to deconstruct the data packets built from the SPI reads/writes to the FIFO buffer. These formulas use the numbered column headers for the bytes 1-16 to index along the Packet data and chop out the correct hex byte. Once we identified the byte values that correspond to the changes, decode them into more human-readable control values. If we’re going to fully understand how the X4 communicates, the handset’s setup of its A7105 radio is the best place to look for all the fine details – especially if we plan to re-implement the protocol later (we do). Time to decode the SPI register commands using the A7105 datasheet… (this is a lot of manual effort, but you can make it fun if you use a lot of nice colours 🙂 ). Stage (1) – The first stage consists of configuring most of the radio parameters including the I/O pins, frequency and channel configuration, and the initial ID code. Many of the commands are simply resetting the register values and initialising the registers ready for operation. Stage (2) – This section appears to consist of the IF Filter Bank Calibration procedure (as described on page 63 of the A7105 datasheet). Stage (3) – This section appears to consist of the VCO Bank Calibration procedure (as described on page 64 of the A7105 datasheet). Stage (4) – This section also appears to consist of the VCO Bank Calibration procedure, but this time setting the auto-calibration register. Not entirely sure what this bit is about. Stage (5) – This section appears to be the preparation for Stage 6 (the channel selection procedure). It consists of setting the channel to the first available channel (14h) and setting the Received Signal Strength Indicator (RSSI) detection settings. Stage (6) – This section is the channel selection procedure’s listen phase. It appears that in order to choose the appropriate channel, the Hubsan X4 monitors the 12 available channels (14, 1E, 28, 32, 3C, 46, 50, 5A, 64, 6E, 78, and 82) to detect which has the strongest signal strength. This is done by switching to the channel under test, sampling the RSSI value 15 times, then calculating the average (mean) of the results. Once all 12 channels have been tested, the channel with the highest RSSI is selected for good, the transmit power is set, and the receiver gain is configured. Stage (7) – Stage 7 is the commencement of the handset discovery announcement transmissions. From here the controller broadcasts announce packets as the first step in the binding handshake protocol. Discovery: The handset broadcasts discovery packets until an X4 quadcopter responds. The discovery packets contain a random 4-byte session ID in bytes 3-6. Byte 2 is the channel selected during the set-up stage. Byte 1 is the binding sequence number. Byte 16 is a checksum – more on this later. Handshake 1: The handset and quadcopter exchange handshake packets with an incrementing sequence number. Session ID: The handset changes it’s transceiver ID Code to the random session ID. Handshake 2: The handset and quadcopter exchange handshake packets with an incrementing sequence number (again). This time Bytes 7-8 contain \x03\x07, but I’m not sure why. Tx/Rx Power: Transmit power and Receive gain is set. 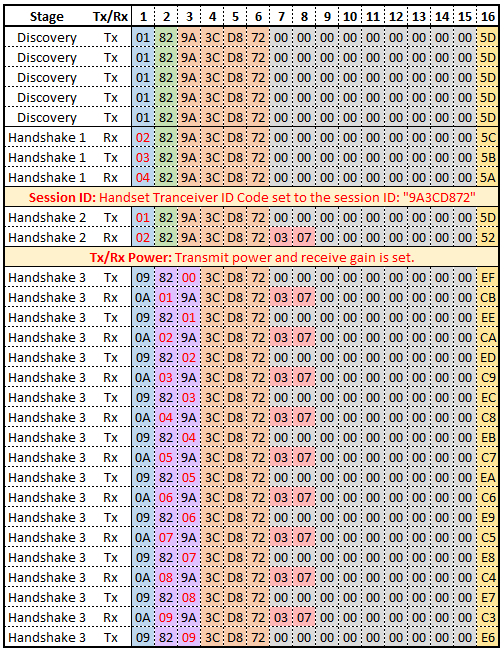 Handshake 3: The handset and quadcopter exchange handshake packets with an incrementing sequence number (again – a different structure this time). The controller uses \x09 in Byte 1, whilst the quad uses \x0A. The alternating incrementing sequence numbers are sent in Bytes 2-3. Once the controller has incremented all the way to \x09 the binding is complete and flight control packets start flowing. The control packets are terminated with a 1-byte checksum value at Byte 16. For those who are unfamiliar, checksums are regularly used to determine if a packet has been corrupted in-flight in some way (due to noise, etc…). They are computed when the packet is constructed and sent, then recomputed by the receiver to see if the checksum matches. There are a huge number of algorithms that can be used to solve this problem, ranging from the simple parity check to cryptographic hashing. In embedded systems and simple RF protocols where space and computing power is an absolute premium, we can expect that quite a simple algorithm is used here. Testing a basic XOR parity algorithm doesn’t have much success, so lets take a look at the data en-masse and try to spot some clues – time for a spreadsheet! – The sum of every byte in the packet (including the checksum) always equals a multiple of 256 (e.g. 512, 768, 1024). In particular, the checksum is always the number that needs to be added to make a multiple of 256. – Incrementing one byte by a single bit (such as in the binding handshakes) decreases the checksum value by exactly 1. From these observations we can reasonably guess that the value of the checksum is simply the difference between the sum of the data bytes (1-15) and the next nearest multiple of 256. We can work out this difference by dividing the sum of the data bytes by 256 and subtracting the remainder (the Modulo) from 256. By isolating each control (with the exception of Throttle, which we can guess has to be applied all the time for the other controls to work), it will make it much easier to spot which bytes change in response to our tests. [Rows 390-850] Byte 3 appears to go from \x00 (dec 0) to \xFF (dec 255), then back down to \x00. [Rows 1250-1420] Byte 5 has an initialized value of \x80 (dec 128), descends to \x44 (dec 68), and then back to \x80. [Rows 1562-1719] Byte 5 has an initialized value of \x80 (dec 128), ascends to \xBF (dec 191), and then back to \x80. [Rows 2344-2480] Byte 7 has an initialized value of \x80 (dec 128), descends to \x41 (dec 65), and then back to \x80. [Rows 2616-2777] Byte 7 has an initialized value of \x80 (dec 128), ascends to \xBF (dec 191), and then back to \x80. [Rows 2923-3068] Byte 9 has an initialized value of \x80 (dec 128), ascends to \xBF (dec 191), and then back to \x80. [Rows 3279-3392] Byte 9 has an initialized value of \x80 (dec 128), descends to \x41 (dec 65), and then back to \x80. We can clearly see the difference here between regular mode and expert mode – it looks like regular mode limits Yaw, Pitch and Roll to half their maximum values (+/- 63 in each direction), while expert mode unlocks the full range (+/- 128). We can also see that no special messages get sent when you execute a flip, it’s just the acute shift in the pitch or roll that that does it – neat! Using similar test techniques we can decode the remaining controls like the LED toggle and switching to Expert mode. I hope this walkthrough helped illuminate some of the ideas and techniques that I used to reverse engineer the X4’s control protocol – it’s a really fascinating bit of gear and for the price it’s absolutely perfect for hackers looking to have a play with outside-in flight control systems on the cheap. If you have any questions about the decoding, feel free to ask in the comments! Tune in to Part 3 for the full protocol description. Hi Jim, GREAT, GREAT, GREAT WORK! Thank you! Important question : do you know if it is possible to control your drone with 2 RC at the same time? I want to set an ArduinoMiniPro-controlled A7501 onboard of my H501S and I want that brutally take control over my RC-human-driven pro device. IYO is it possible? Thank you. Woah, that sounds like a cool project – great idea! If I understand correctly, you want to basically have an electronic warfare drone (the H501S) that can hijack a Hubsan X4 (or any A7105-powered quadcopter) mid-flight? – Finding the frequency that the victim quad is using to communicate with it’s transmitter, and sniffing the hardware ID’s so you can impersonate the controller. – Flooding the quadcopter with enough control packets to mask or disrupt the real controller. You could flood the airwaves with control packets impersonating the control but with all the throttle values set to 0 to bring it down. I think if you transmit them faster than the real controller, the quadcopter will try and obey them. This might be quite easy for me to test, if I get some time to try it out I’ll let you know. Hi Jim. No, my idea is another, not so criminal as you argue 😉 and not so cool! I simply want to hijack my flying h501s to make it change direction by himself at a triggered event. Thank for your reply, I’ ll work on it.